One of the Internet’s fastest-growing retailers is also one of its slowest shippers, reports The Wall Street Journal (May 4, 2014). The mom-focused discount site takes an average of 2-3 weeks to get merchandise to customers, well off the pace of online veterans like Amazon.com and ShopRunner Inc., which have been training shoppers to expect delivery in 2 days. 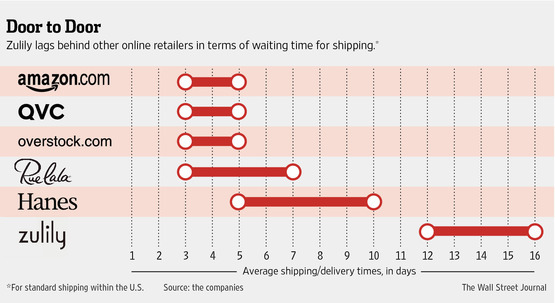 The slow shipping times are the result of a bare-bones distribution system that is enabling 4-year-old Zulily to turn a profit in an industry where some of its peers have struggled. Zulily’s sales have soared thanks to its ability to get women to browse regularly for deals and make what are largely impulse buys before the sales end. But Zulily’s Achilles’ heel may be shipping. Last year, it took an average of 11.5 days for items to be shipped from Zulily’s warehouses after customers ordered them. The reason: Zulily doesn’t buy in advance most of the products it offers. Instead, it orders the items from vendors after the sales end. Vendors then ship the merchandise in bulk to one of two Zulily warehouses, where the products are sorted and combined with other orders before being shipped back out. Customers going to Zulily’s website don’t know ahead of time what deals they will find, and the retailer tries to work the shipping lag into its sales—for example, it is currently selling summer apparel for women and children.